We understand that it can sometimes be a confusing experience when trying to find the right bulb for your car online. 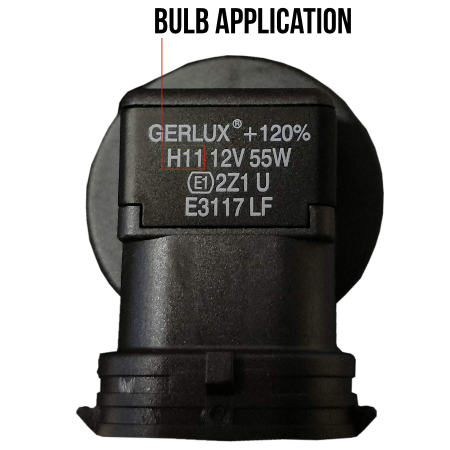 Many car owners are unaware of what bulb type they actually need. Many other car owners don’t know the difference between halogen, LED, Xenon or HID kits. We’ve compiled a quick and easy car bulb guide for you to browse through and hopefully learn the basics on car headlight bulbs. Which bulb do I need? Is it a H1, H3, H4 etc…. Should I go for brightness over lifespan? Which is the Correct Bulb For My Car? Every car, make, model and year can be completely different from one another so finding out what type of bulb you need can often be a confusing task. Luckily, we have a sophisticated car bulb finder that searches a database of around 2 million different factors in order to find the correct details about your car. Using this tool you can simply enter your registration number or select the details from the drop down list and you will be taken to the results that display which car bulbs you will need. If we don’t have the details for your car, van or motorbike then your vehicles’ manual should indicate what bulbs you need. If you don’t have a manual to hand (or if the info is less than helpful), then the next step would be to remove the bulb from your vehicle and inspect the metal or plastic base of the bulb itself. This should be marked with specifications telling you what application the bulb is, the wattage and sometimes the colour of the bulb. 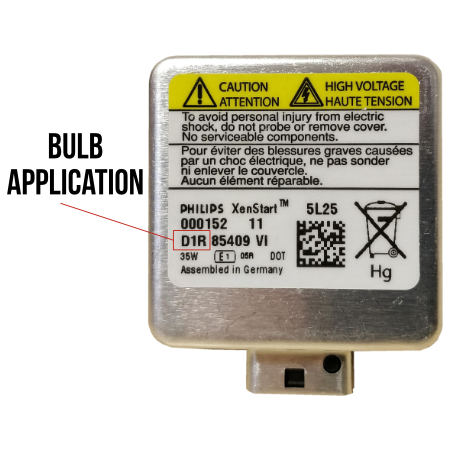 The bulb you need should be marked or detailed with an application number such as “H1, D2S, 9005, HIR2 etc“. Simply enter your registration and click the “GO” button. If your vehicle’s registration isn’t in our database then try using the right hand side of the car bulb finder. Select your manufacturer, model, type and year and proceed to the next step. Following step one, you might be presented with a pop-up that asks what type of bulb technology your vehicle came with from the factory. This might not appear for every vehicle. Your user manual will usually state whether your vehicle is Halogen, Xenon or Bi-Xenon. If this box appears for you then just select the appropriate vehicle type. The next page you are taken to will show you all of the bulbs that we think will fit your vehicle. Please bear in mind that some data may not be present due to the ever expanding database of registered vehicles in the UK. 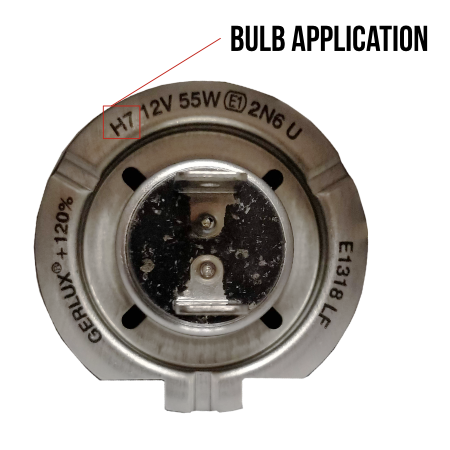 If your original bulb was an H7 bulb then any H7 upgrade or replacement should fit. 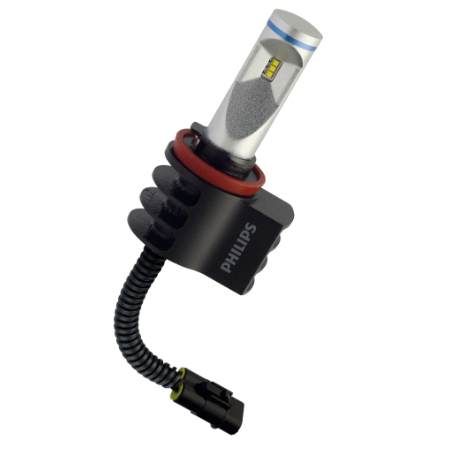 Please keep in mind that some car bulb holders might not be suitable for upgrading from Halogen to LED however we can supply you with the solution required to fit the bulb. Want to see it in action? Here’s a quick and easy video guide for steps one to three. Discovering the differences between halogen, xenon and LED bulbs can be difficult to comprehend at times so we’re hoping that this section will help you fully understand the types of headlight bulbs available. 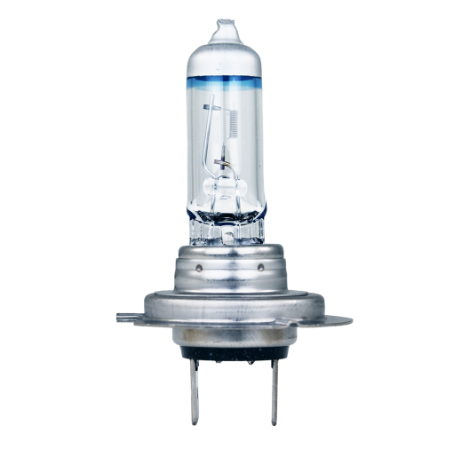 Halogen bulbs are a mixture of inert gas with a small amount of halogen gas. The addition of Xenon gas into the mix allows the filament to burn brighter to increase light output. The addition of a blue coating to the bulb will turn the colour of the light to be more white. The downside to this is a small reduction in light intensity. Bulbs with a higher wattage produce more light but have a shorter lifespan. Their colour range spans from 2900k to 5900k making them quite diverse bulbs. These types of upgrade bulbs usually range between 20% to 150% brighter than standard halogen bulbs. High power bulbs usually last less than 1 year where as long life halogen bulbs can last up to 4 years. Halogen headlight bulbs are typically the standard bulbs in most cars. ABD.co.uk has a range halogen upgrade bulbs which include long lasting bulbs, brighter bulbs or bulbs designed for style. 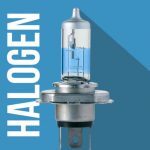 Halogen tends to be a cheaper alternative but you might want to consider between price vs performance if you are looking for the best possible outcome. There is a “light versus style” trade off with halogen bulbs between achieving the most light output and having a whiter coloured light. A blue coating will make a halogen bulb whiter however this will reduce the light output. This is what we call the Drivers’ Trade Off. If you decide to have whiter lights, just keep in mind that you will be sacrificing the actual light output. Aside from being a cheaper alternative to most LED headlight bulbs, the main benefit to choosing halogen is that there are no CANBus errors when you change the bulbs over. Not only are the bulbs perfect for an error free experience but you will also have no bulb holder issues, fully road legal and are a completely low hassle option. It’s definitely worth mentioning that LED bulbs are the youngest bulb types for vehicles. Since the technology is still fairly new there may be issues with your CANBus system displaying errors. The technology is advancing at a fast pace and we predict that it will soon overtake HID kits in both performance and power. 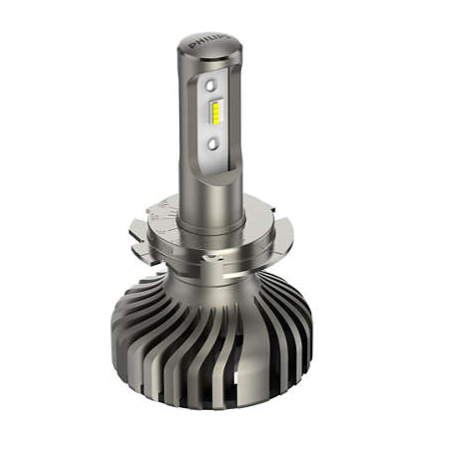 Each new LED product that is released to the public seems to have an increase in performance, technology and compatibility. This is completely accurate. Many retailers sell cheap LED bulbs claiming to be incredibly bright however the position of the bulb can dangerously affect the beam pattern which can be hazardous to other road users. If you’re shopping around for LED headlight bulbs then we highly suggest only buying branded names like OSRAM, Philips or Twenty20. Try to avoid retailers that claim high brightness levels yet appear to be from an untrustworthy supplier or manufacturer. 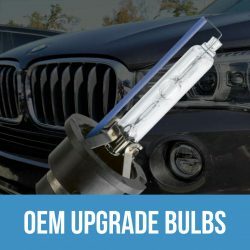 Some car owners become worried about upgrading from halogen to LED bulbs so we put together an LED Brightness guide a while back that might come in handy. Big brand names within the market have been investing heavily into LED headlight bulbs and their are major improvements with every product. From fan-less LED headlight bulbs to incredibly bright LED bulbs for your car, the choices are becoming broader. 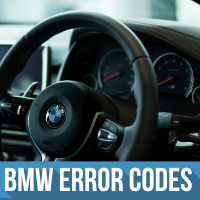 Some vehicles might experience CANBus errors but we’ve also got this covered in our CANBus errors guide, complete with video. 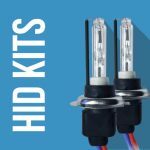 HID Kits pack an additional 300% – 450% more light when compared to standard halogen bulbs, they are renowned for producing immense lighting for your vehicle. Containing Xenon gas, these bulbs are often the perfect upgrade choice when showcasing your vehicle. 35W HID Kits produce up to 350% more light. 55W HID Kits produce up to 450% more light. Unfortunately HID kits no longer pass an MOT within the UK. They can still be used for off road use such as on private land for events, cross country and track events. A simple plug and play system means even a novice can install. This simple system means you can easily switch between your HID kits and your road legal bulbs. It’s worth noting that HID kits are by far the brightest headlight upgrades on the market. There are no other upgrade bulbs available in 2019 that can compare. Choosing between style, brightness and your bulbs’ lifespan can sometimes be a difficult choice. Understanding the difference between them doesn’t have to be though. When choosing a bulb for your car, try looking for a mixture between a decent lifespan and a good level of brightness. Our website allows you to filter between different options when trying to find the best headlight bulbs for your vehicle. These bulbs are designed to provide as much light as possible whilst retaining their road legal status. Usually between 10% – 50% whiter and 60% – 150% brighter than standard halogen bulbs. As these have the highest bulb performance, they come with the shortest life (except for high wattage bulbs). You would typically get between 1-3 years of use before they need to be replaced. The purpose of vision and style bulbs is to offer a good combination of extra light and that sought after stylish whiter light. These bulbs usually give up to an extra 60% more light yet they allow you to still have a nice crisp white beam pattern. Long life headlight bulbs last much longer than standard or upgrade bulbs. They are not designer for light output improvements on either brightness or colour. The light output would typically be very similar to a standard bulb. However where they win over the others is that they significantly outlive them. Typically these will last a good 4-8 years depending on driving habits. 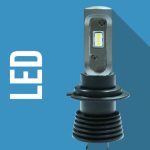 These are a great alternative for owners who are not so concerned with improving light output and simply don’t want the hassle of repeatedly changing bulbs. 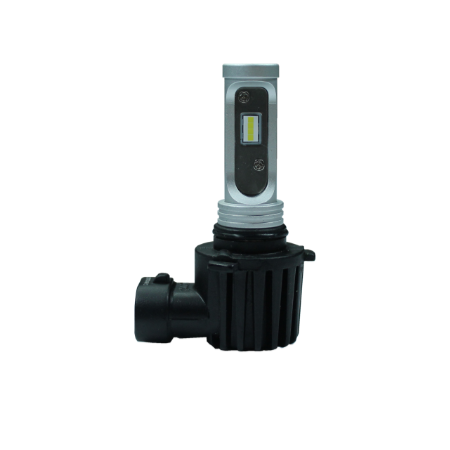 Off road headlight bulbs main purpose is to provide you with as much light as possible. They do this by simply ramping up the power. Not economical, but they do provide the highest light intensity over the road legal options. Due to this high wattage, they are the shortest life bulbs on the market, typically lasting 6 months – 2 years depending on their use. Sometimes you just have a bulb that’s failed and you want to get the car back on the road. If you’re not into the whole upgrade scene, then a simple bulb replacement is probably what you’re looking for. These are a like for like replacement for your existing bulbs, no frills and great value. Q. Will my new bulb(s) fit? A. Yes, as long as you have selected the same fitting as your current bulbs. Let’s say your old bulb was a H1 halogen. As long as you have replaced it with another H1 bulb (halogen, LED or HID) then it should fit. Q. Will my new LED upgrade bulb fit? A. Yes, most of the time. There are two issues you might come across with aftermarket LEDs. The first is if you have a specific bulb holder designed for halogen bulbs. If this happens, we can usually supply LED bulb compatible equivalents to use instead. Q. Will my car show a CANBus error with my new LED’s? A. In 95% of cases, no. That is as long as you are using a “CANBus compatible” LED bulb. However there are a few very fussy vehicles out there which might still complain. There’s no way to be 100% sure until your new LED’s have been fitted. If they do show CANBus errors then they can be simply resolved using CANBus resistors or control units. Q. What does “OE bulbs” mean? A. OE stands for Original Equipment. In this context, it is referring to the part that was fitted by the factory when the car was new. 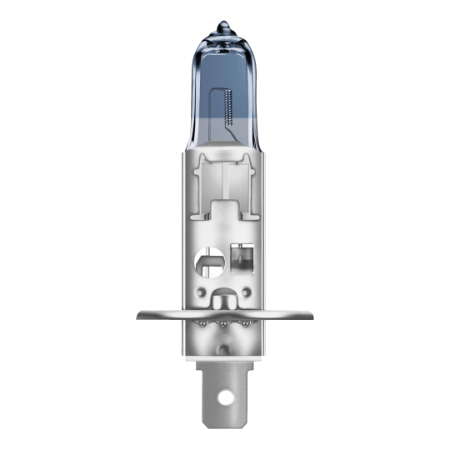 OE is often used in Xenon HID technology to highlight they are to replace the bulbs on cars that had HID fitted from new. 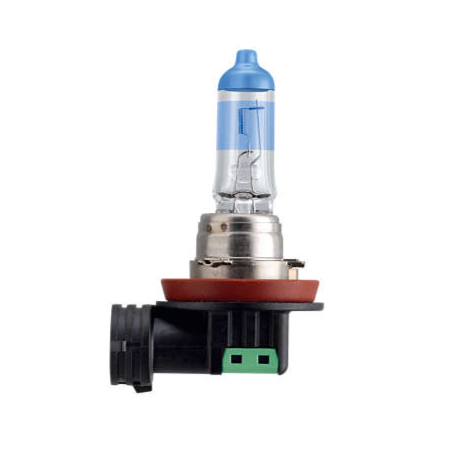 Aftermarket HID bulbs tend to be for those who have upgraded from halogens to HID. Q. What’s The Difference Between Dipped And Main Beam? A. Your dipped beam (low beam) is what you have on all the time when driving at night. 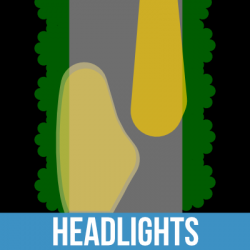 Your main beam (high beam) is what you put on when on dark country roads without street lights, or when flashing other drivers. Q. What do colour temperatures mean for car bulbs? Did You Know That Headlights Point Right in Europe? Why Aren’t There Rear Wiper Blades on Saloons? Copyright © 2005 to 2019 Autobulbs Direct Ltd.